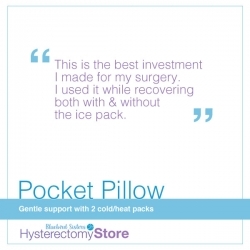 Pocket Pillow - Hysterectomy Recovery Tummy pillow with 2 cold/hot packs is used to provide gentle abdominal compression after surgery. 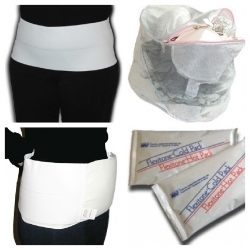 The Cold/hot packs provide cooling affect on your tender incisions and swollen belly. 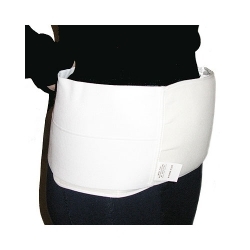 This tummy pillow for surgery recovery features a pocket made from contrasting fabric to hold a hot/cold gel pack for soothing heat or a cooling therapy to help swelling near your incision. 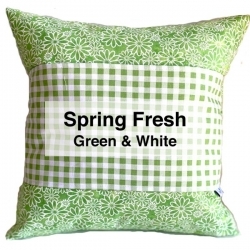 This pillow can be used from the first day, supporting your abdomen when you cough or sneeze. 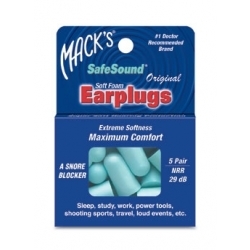 Place it between you and the seatbelt on your ride home from the hospital. In bed or lounging on the couch, use this pillow to support your tummy as you lay on your side. Your tummy may feel sore but this colorful pillow should comfort you. 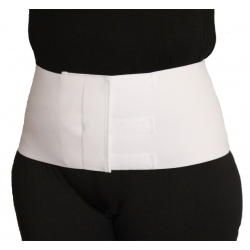 The tummy pillow is great for other surgeries, too: tummy tuck, c-section, hernia repair, and other abdominal and laparoscopic surgeries. 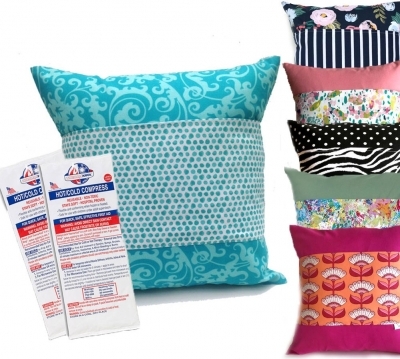 This Pocket Pillow is handmade with loads of love for your tummy care after surgery. 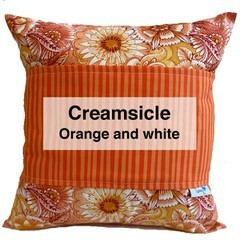 The Tummy Pocket Pillow has a contrasting pocket and is made from a variety of beautiful color choices. Includes 2 Cold/Hot Packs. You can buy additional cold/hot packs. Pillow: 100% polyester fiberfill. Cover: 100% cotton is approximately 13" x 13". The cover is handmade and may vary slightly in exact sizes. Care: Remove cover from pillow. Wash separately. Cold water wash. Tumble dry low. P.S. If you see a color you like, order it now! Our fabric changes regularly based on availability. Once a color is gone, its not guaranteed to be back in stock. How important are pillows to surgery recovery? Pillows are an important aspect of your hysterectomy recovery and other surgeries like C-section, tummy tuck, hernia repairs. It is recommended that you hold a small pillow (like our Pocket Pillow) over your incision as you cough or sneeze which provides support to your tender belly. Additionally, place a small pillow between your tender incision area and the seatbelt on any car ride to make a safer and more comfortable car ride. We suggest leaving a pillow in the car for this purpose. Once you are at home, your tummy pillow can also be used to prevent pets and small children from bumping your incisions. Why does this pillow have a pocket? 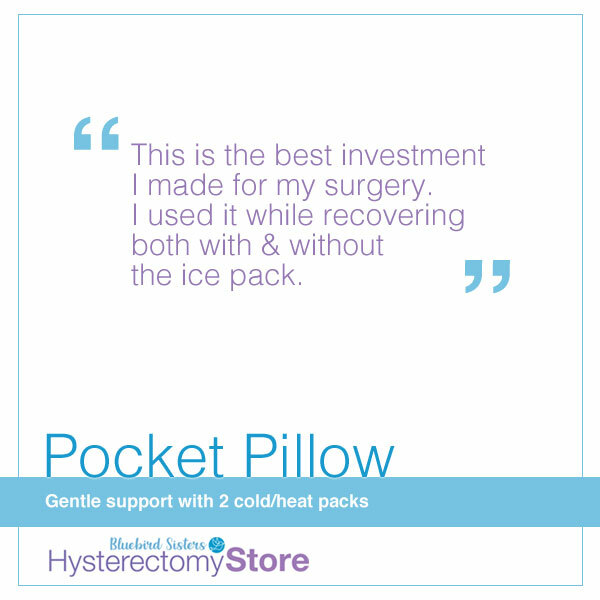 The pocket on the Hysterectomy Pocket Pillow is to hold an ice pack or a heated pack for your comfort against your tender abdominal incision/s. Our Pocket Pillow comes with 2 cold/hot packs. We send you two so you have one to use while the other is in the freezer or being warmed in the microwave. When this particular tummy pillow was developed, the HysterSisters let us know they were using our cold/hot packs between them and their pillow. "Genius!" we thought! And so, our next generation of tummy pillow added the pocket for the cold/hot packs. How do I wash my Pocket Pillow? Remove inserted pillow from the cover. Wash the cover and the pillow separately in cold water, delicate cycle. Tumble dry low or hang to dry. 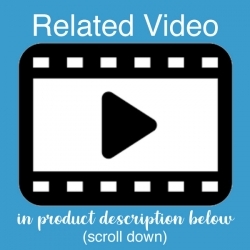 What is the pillow made from? 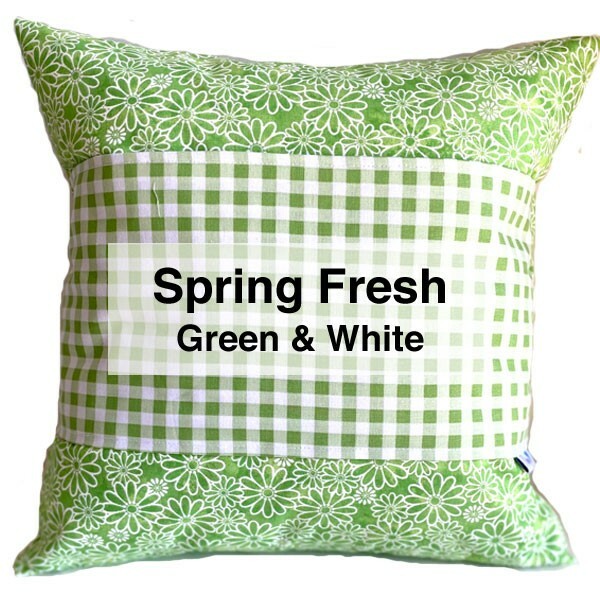 The pillow insert is 100% polyester fiberfill. 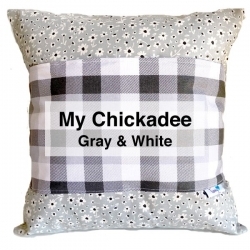 The Pocket Pillow cover is 100% cotton. 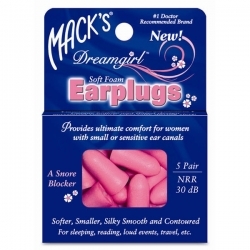 What is the Pocket Pillow size? 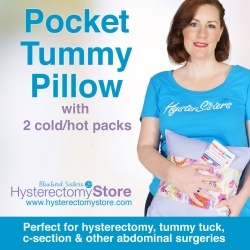 The Hysterectomy Pocket Pillow is approximately 13" x 13". 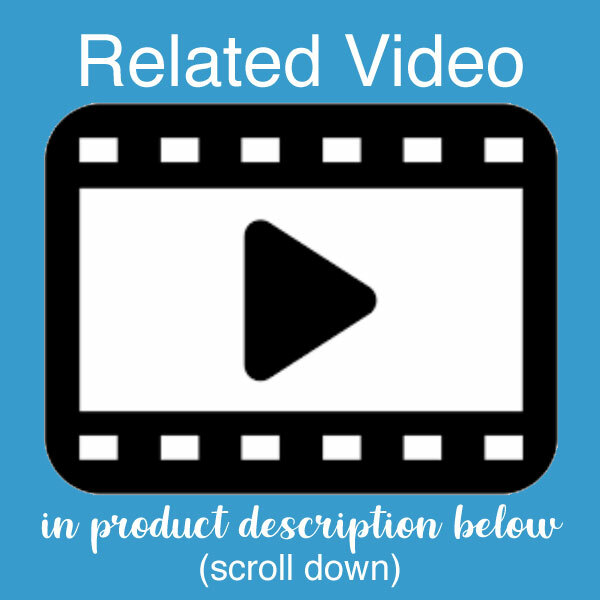 The cover is handmade and may vary slightly in exact sizes. You are out of my favorite fabric. Will it be back in stock? 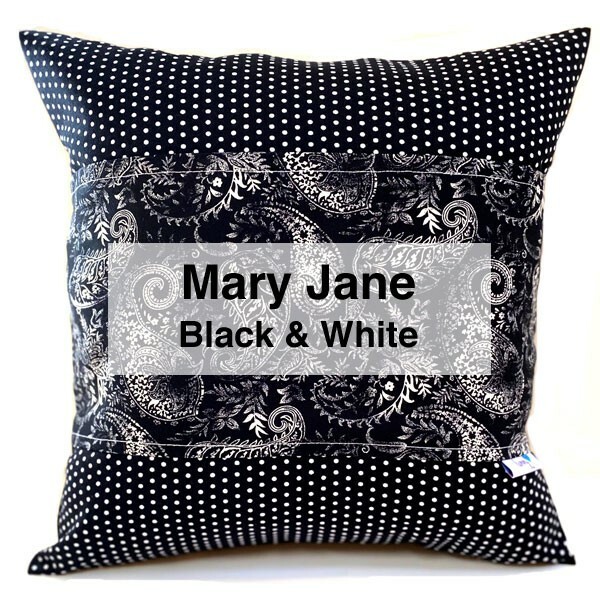 Our fabric choices change regularly based on current availability from our vendor. Once a fabric choice is out of stock, we may not see it again. Order your favorite when you see it - as we have no way of knowing how long it will remain in inventory! Who makes the Pocket Pillow for Hysterectomy Recovery? 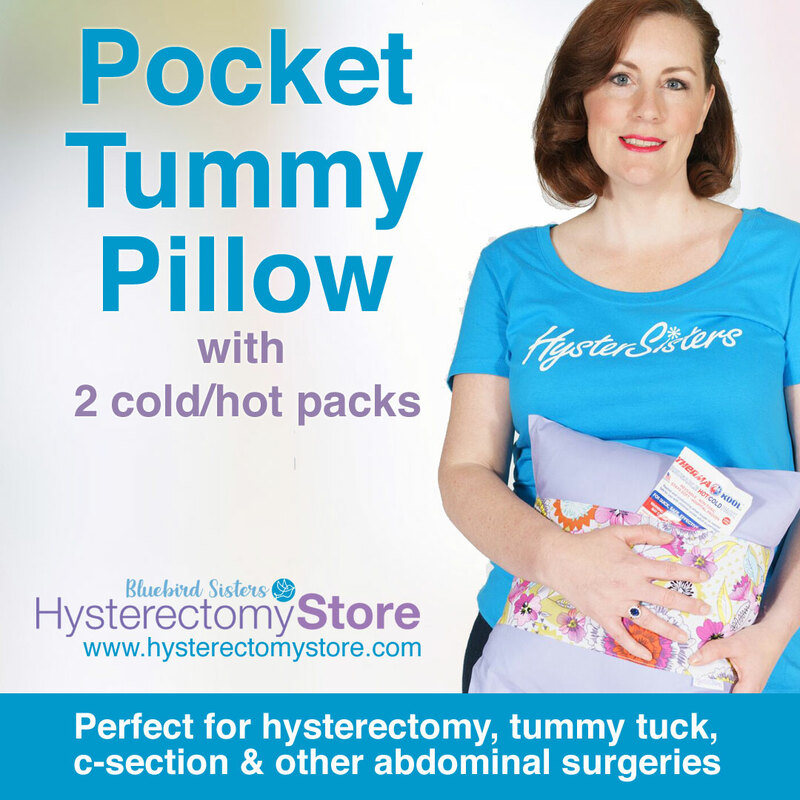 The Pocket Pillow was designed specifically for the Hysterectomy Store by women who understand the comfort requirements after a hysterectomy. They are handmade by seamstresses in the USA. 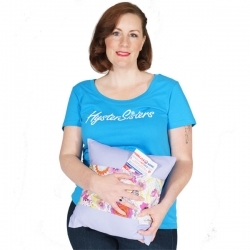 I bought this pillow along with the Hysterectomy prep set and wondered if I would need it. I did! I brought it to the hospital and used it there to help prop myself up. The nurses even kept my cold packs frozen for me! On the drive home, the pillow was my companion and cushioned my 30 minute ride home. I kept it with me everywhere in the house. Perfect. I bought a purple one! It cheered me up! I used it for the car ride home at first. Sits perfectly over my incision making the seat belt more comfortable. Now it stays in bed next to me, filled with my "stuff"
I am scheduled for my hysterectomy in August 2016 but decided to order my pillow and ice packs ahead of time so my ride from hospital could be easier on the tummy and seat belt across my shoulder. Good thing I ordered it early because my son sprang his knee muscle from jumping off the stairs. He immediately needed ice on the torn muscle and this pillow worked like a charm. He was able to elevate his knee in the bed while icing his muscle and especially at nite when the pain was achy. So glad I had my life saving pillow and cold pack. It saved him from getting a veggie pack from the frig to relieve the pain.I would recommend this pillow with hot/cold compacts. 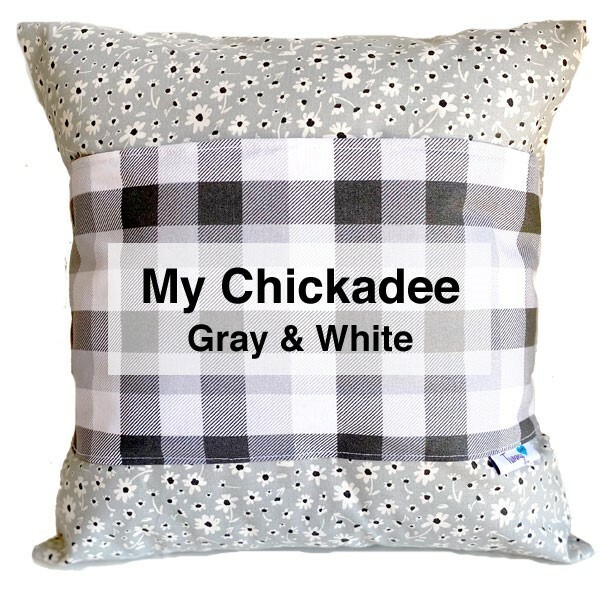 I have used this pillow more than anything else following my hysterectomy. The fabrics are pretty and vibrant-cheery even! It's the perfect size to take on car rides or even to sit on when you are ready to get out of the house. I love that it comes with 2 of the freezable ice packs. I use the pillow when sleeping since I am a side sleeper and it stays put through the night. The cover slips off so you can wash it. I will continue to use this pillow as I recover and after. You will not regret buying this pillow! I used this as soon as I was leaving the hospital, and am still using it to drive now that I'm in the recovery stages. The pocket thermal-packs are super useful as well, enabled me to free up my heating pad for use on my back, while still keeping my tummy warm. This pillow is great for seatbelts and anytime I got up to move around post-surgery; kept a lot of the extra pain I could have had at bay. Would not go through another surgery without it! The Tummy Pillow is well-built and very helpful. I used it while in the car (protecting the belly from the seatbelt and chafing) as well as when I needed to use the ice pack. It's lightweight so not a burden to have on the bed with the other pillows and pretty to look at (I picked the Vintage Aqua & Red). It was a great purchase for me.